Here at Jalopnik, we love seeing some really crazy builds. Cars are largely very boring these days, so anything that comes along that makes us stop and go, huh, is appreciated. Today’s spectacle? A BMW V10 engine stuffed into a Lotus Elise. Hell. Yes. To start, I just love the idea and the audacity of this build. The guy behind it, Dustin Anthony, took one of the smallest cars on the market and stuck one of the most badass engines ever offered on a road-going vehicle in it. I reached out to Anthony to find out a little more about the V10 Elise. Here’s what he told me. Three years ago, when Anthony was 24, he started out with a 2006 Lotus Elise. He wanted to put the BMW 5.0-liter V10 in it because he envisioned his build to be a time attack, track-based car that you “could also drive to church on a Sunday” with. He was especially drawn to the high-revving, Formula One-based V10. But aren’t we all? 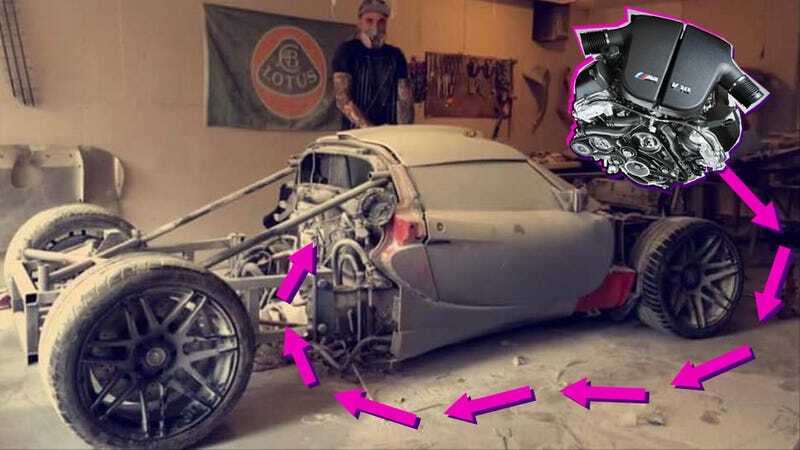 Plus, with the help of a a CNC machined adapter plate and a custom-made clutch, he was able to bolt up the engine to a Porsche GT2 six-speed transaxle, just flipped upside down. I designed the chassis and FEA tested it in SolidWorks, along with the uprights and control arms. Extending the wheelbase to 110 inches, widening the track 14 inches, and re-calculated the suspension to ensure the geometry of the car is on point for handling. Then, [I] built a new body to fit the extended/widened chassis. I designed, tested, and built the entire electrical system myself, along with the headlights from scratch. I am the only person that has worked on the car. 100 percent alone and have spent almost every pay check I have to complete this project. $72,000 in parts, and 3 years of hard labor. Anthony said that this V10 Lotus is strictly his test car. He hopes to complete the build sometime in July, after some wind tunnel and track testing. And after that, Anthony also said that he’ll be taking pre-orders for the next supercar he makes, as he owns a custom supercar shop called Monivetti Automotive. For sale or not, this is one of the most badass builds I’ve ever seen. Lotus for sure started the trend by putting other people’s engine in its cars, but this one takes the cake. And Anthony is right—everyone under the sun does an LS swap. Why be conventional, especially when you have an Elise at your disposal? You go V10 or you go home.